Yesterday marked 17 years since the abrupt death of the young composer and playright Jonathan Larson, best known for his creation of the Pulitzer-Prize and Tony-Award winning musical Rent and the lesser known but still wonderful Tick, Tick…Boom! NEW YORK — It was closing night for the new musical “Rent” at the New York Theatre Workshop, a 150-seat East Village theater where the pop opera, loosely based on Puccini’s “La Boheme,” opened in February. Onstage, friends and creative personnel, including director Michael Greif, mingled with the youthful cast and band in the kind of pizza-and-beer ritual that has been repeated countless times in experimental theater spaces. But this celebration was distinctly different. For one, television cameras and reporters were present at what had all the giddy earmarks of a bon voyage party. And indeed, this was not just a closing: “Rent” was on its way into previews for its Broadway opening April 29, and, though no one could have known it at the party, it was also on its way to winning the Pulitzer Prize for drama last week, two more stops in what has been one of the most extraordinary journeys in recent theater history. My experience with the musical Rent is a bit non-linear. Rewind back to my first years at School of the Holy Child, circa 1996-1997. I first heard about Rent on my long bus ride home from Rye. Back then, the Tarrytown bus used to pick up 4 different schools from the Rye area, since there were a limited number of buses. I remember sitting near the front with my headphones on, and overhearing the group of kids from Rye Country Day talking to each other about their school’s musical production. Their conversation turned into discussing their favorite shows, and another girl responded to the other with, “That show was good, but it’s not as good as Rent….” In my mind, I though, “what’s Rent?” With comments like theirs fanning my curiosity for the show, my mom and I got tickets and made our way to the Nederlander. At this point, I had not heard a single song from the show, and was completely in the dark as to its musical style and subject matter. 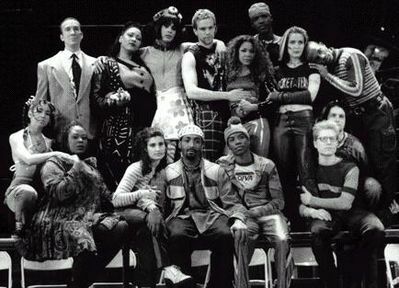 Many years have passed since then, and during that time I have read and watched a number of reviews and commentaries about Rent, where opinions of members of the creative team and critics were shared. They have already said what I want to, and probably in more eloquent terms, but suffice to say that neither I nor my mom could believe what we saw that day – a rock musical whose music was not distracting to the sensitivity of the story, but instead actually projected the emotional weight and depth of the show, as good rock music should. Jonathan Larson bridged the gap between “show people” and those who simply love music and can appreciate brilliant storytelling. As all of these emotions flooded me, seemingly out of nowhere came “Contact.” I think this is the number out of the whole musical that struck me the most, both stylistically and symbolically. I thought that “Contact” validated and expressed the anxiety that characterized my generation and my friends, but had not yet been articulated in such an explicit way. The loss of the “free love” of the 1970s was replaced in the 1980s, when I was growing up, by a terrible, crippling fear of disease that was always there, lurking in your everyday activities and relationships. Wilson’s performance simply amazed me, it was death and ecstasy and fear and relief simultaneously. What amazed me so much about Rent as a whole was that none of the actors on stage looked or sounded like what you would normally think “Broadway stars” would sound like. I was so happy to see such an eclectic, beautiful group of young people on stage who were able to create this gorgeous music without sounding like “singers.” The suspension of disbelief was not lost by having older, extremely seasoned performers dress in street clothes and suddenly belt out “Light My Candle” or “Halloween” like an aria. I felt as though Anthony, Adam, Daphne, Idina, Fredi, Wilson, and Jesse could have been my friends, and that they just had the ability to capture a certain spirit –a combination of uncertainty, bravery, fear, humor, love, and compassion—and project it to audience members with such resonance. I think that one of the reasons why the show is so accessible to young audiences in particular is that every one of us are really a Maureen, Mark, Mimi, Roger, Collins, Angel, or Fredi, using their activity of choice to try, in some way, to make a mark in the world while still trying to survive – to make an “honest living.” There was a level of respect from them on stage towards the story that Jonathan was telling, and the messages he wished to convey that I had never witnessed before. 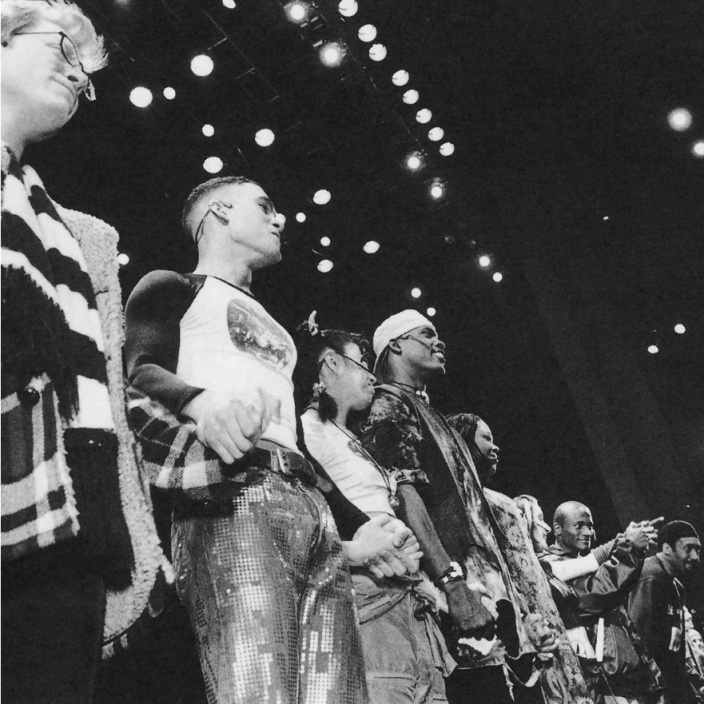 Even at the tenth anniversary performance last year (which I watched via bootleg), I remember watching Anthony, after the “Seasons of Love” opening, put on his striped scarf with a type of reverence and humility that reminds the audience of the show’s core, and prepares them to be moved by it again. I think that the reputation of that cast’s performances continue to be an inspiration to all of the subsequent casts, not only of Rent, but of other shows as well. Anyway, getting back to my chronological history with the show – the movie came out right when I was in the middle of my James Joyce academia overload. I was in the middle of college and taking probably my most heavy course load yet – reading Ulysses, singing in the Purchase Chorus, having senior project anxiety, etc. A year or so before the movie’s release, I remember sitting in the movies with my mom and watching the first preview end. Then, I remember hearing the first few bars of “Seasons of Love” and seeing the opening image of the movie on the screen. I literally jumped in my seat, and went “Oh my God! !” My mom gave me a look like “Oh, jeez…” – the tired look of a non-musical lover. Needless to say, I was so happy that they were making the show into a movie, and the images that they used in the previews looked really beautiful. I didn’t see the movie in the theater, but I rented it one weekend, watched the first minute and a half, and turned it off. I think because I was so stressed at the time between school and everything else that was going on, that I simply just wasn’t in the right mindset to sit and watch a movie musical. I think I also expected that the film was going to be more like a movie, not necessarily a movie musical. The image of Mark getting on his bike while singing the title song just threw me – I thought it was cheesy and overdone – and I shelved the film for several months. The next time I watched it was almost a year later. I must have been in an infinitely better mood, but there were also some things going on in my life that I think lend themselves to why I was perhaps drawn to it again. At the time, someone I was close to had just been diagnosed with stage 4 throat cancer, I was close to graduating from college, and inevitably facing the impending fear of leaving the comfort zone where I had excelled for four years and starting out in the “real world.” Not to mention the fact that I was finishing my senior project on Ulysses and getting absolutely no sleep – pouring everything that I had into this piece of writing that undoubtedly NO ONE was going to read. As if that wasn’t enough, my friend with cancer had been told by his doctor that there was a good chance that “this might be it.” I think watching the film and reading in Without You about Anthony’s struggle with his mom’s sickness allowed me to revisit the themes of Rent and remind myself of the message that the show sends. As all of these things were occurring simultaneously in my life, I was not only experiencing grief, anger, fear and sadness, but also watching my stepfather experience them everyday as he prepared for his difficult chemotherapy and radiation. Mark’s line “why am I the witness” –one that has always moved me — became increasingly more poignant each time I listened to the recording. Watching the movie after being away from the Broadway show for so long made me feel like I was seeing Mark, Roger, Maureen, Mimi, Joanne, Angel, Collins, and Benny for the first time. So many years had passed since I saw the Broadway show that actually matching the faces of six original cast members to their voices on the sound recording was wild. But I think that I was even more impressed by the documentary on the bonus disc about Jonathan Larson’s life and the entire history of the show since its inception through the movie production. It made me feel very old, in the sense that it made me aware of just how much time has passed since the time Rent first came out. New York was different then – the footage of the city in the late 80’s and early 90’s gave me such a sense of how old I am. I realized that some younger Rent fans are probably too young to remember the squeegee men in Lower Manhattan – and that is a scary thought. Watching the way that Jonathan and his friends lived so reminded me of my childhood. My mom and I sat in my room laughing and just shaking our heads at the fact that Jonathan used to host “Peasant’s Feasts” during the holidays ever year – where he and his friends who didn’t have any money would have a big pot-luck dinner and everyone would sing, read their poetry, or play music until the wee hours of the morning. If that doesn’t sum up the way I was raised, I don’t know what does. It was just…very validating and bittersweet to watch footage of the way this man lived his life, and how much of it I relate to. The best way I can describe it is that feeling of “you are not alone.” It’s just too bad that he isn’t around to see and hear from the fans who really understood what he was doing, and support him and are grateful to him for it. Hearing so many people say that Rent is dated and that it’s just about a bunch of lazy, spoiled kids who don’t want to work is very sad to me. Not because I can’t understand the sentiment of being angry towards someone who doesn’t want to work and give up their art (see also: my father) but because the show as a whole is about so much more than that – it speaks to all of our fear of “selling out” and becoming lost in the mix. I don’t really understand how one can’t relate to that. I think part of why I feel so close to Rent is that I truly feel that it’s a musical for my generation. I hear older theatergoers talk about the Golden Age of Broadway, and what a wonderful time it was to be alive, and how it’s all so different now that nothing can compare, etc, etc. And Lord knows I agree with them – I would give almost anything to go and visit those days. But Rent is what we have. 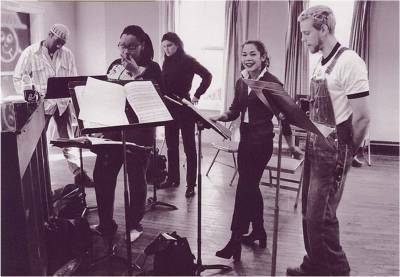 In some ways, Jonathan Larson used Puccini’s classic love story as scaffolding to make his story accessible to audiences. By associating Rent with La Boheme, he inflates this pedestrian group of characters from the East Village in the early 1990s to classic status, thereby celebrating them –not unlike the way that Joyce chose to articulate Ulysses through the proverbial Odyssey. However, he also presents his characters as the absolute center of the story, so that and all the issues confronting them throughout the show become almost accidentals. Like La Boheme, the story is timeless and transferable to any period, yet there is something very validating about Larson’s choice to articulate the struggle that he saw in young artists during his youth. I felt like I had come into the whole Rent scene so late in the game – I was heartbroken when I found out that I had missed the 10th Anniversary Concert and so many other Rent related events from 2006. After reading Anthony’s book and attending his book signing, I wrote him a very long letter just explaining my history with the show, and how much it’s meant to me. He seems to be the self appointed spokesperson for that show, and in some ways almost a conduit to Jonathan, having been involved in the show since its inception. I just felt like I had to let him know how I felt, and I obviously couldn’t do that in person during the one minute window that I had with him at the book signing. So instead, I did what I always do: I poured my heart out. I felt like he would “get” what I was saying, and in some ways I went into a few personal accounts because he had done the same in Without You. I don’t know if he ever read it, but I hope so. I was lucky enough to experience Adam Pascal and Anthony Rapp’s return to Rent before its closing in 2008. It was an experience I will never forget, and something I’ve written extensively about. I remember in my freshman year of college, revisiting my Rent recording, and listening to “One Song Glory” on my discman in bed. It had been so long since I’d listened to it that I’d almost forgotten about the song. It’s at that moment that I think the audience sees the strength that still resides in him — the hidden determination and youthful stubbornness that he still has in spite of himself. Hearing Adam’s gruff, melodious voice deliver such poignant lines as “One song, before the sun sets, Glory, on another empty life, time flies, time dies glory – one blaze of glory” made me fall in love with the piece all over again. The poignancy of the song resides in the truth of its lyrics – I don’t know any of us who don’t wish, somehow, for an “eternal flame” to “redeem this empty life.” No matter how much we do, what contributions we make, how much love we give, I think that there is still a small part of us all that is afraid of disappearing into the abyss. When you’re in your early twenties, I think that no matter how secure you might be financially, there’s still this feeling that you’re trying to keep your head above water all the time. Deep down I think we all want to make our marks on the world, and in the case of this song, here’s a twenty year old kid hoping that he won’t be forgotten after this horrible disease robs him of his life. That’s enough to make anyone tear up. And to make it even more heartbreaking is listening to this song while thinking about its writer. I don’t think that anyone would argue with the connection between Roger’s predicament and that of Jonathan Larson – an artist struggling to create his big hit in the midst of corporate America in the 1980s. What I have always found ironic, and in the most bittersweet way, is that during this scene, Roger is, in fact, creating beautiful music. He clearly doesn’t see it, and it’s not meant to be ‘his song’ by the fact that he puts his guitar down, but we see that the potential is there. What’s sad is that Rent, in many ways, was Jonathan’s “one song,” and as many have said before, he get the chance to see its effects. 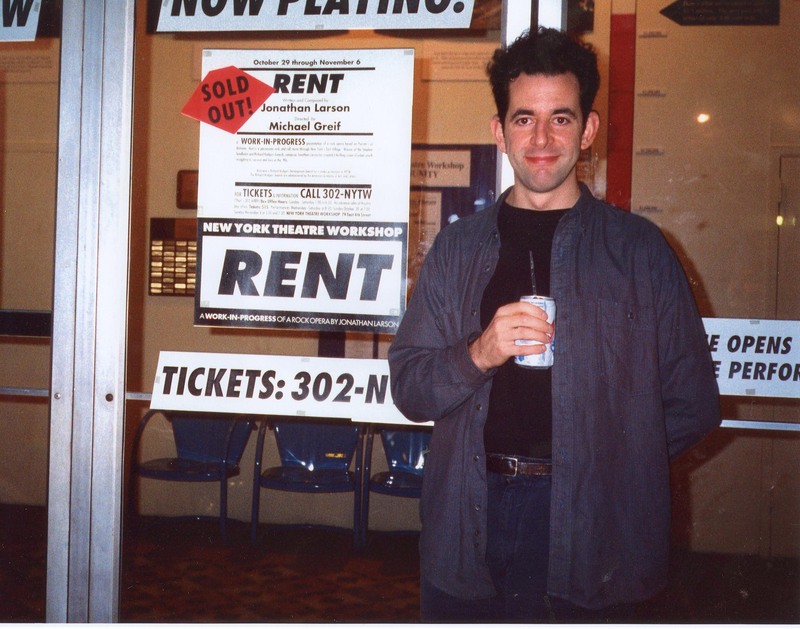 So, in closing, I’d just like to thank Jonathan Larson for his gift to us. We will never forget you. Hope you’re enjoying lots of Peasant Feasts in Heaven with all the friends you’ve lost.